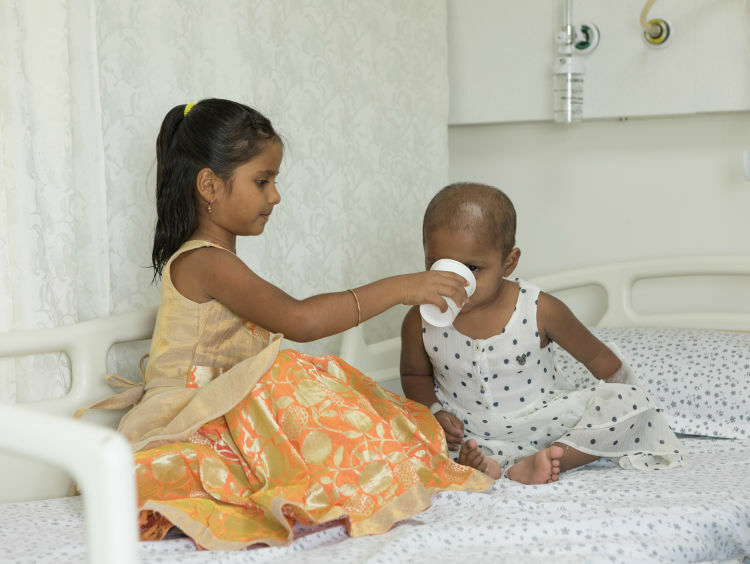 “When Prerna asked me if she could to go to play school, little did she know that she was already battling cancer. She struggled to stand because of an enlarged spleen and joint pains. She had lost a lot of weight and her appetite had decreased drastically. 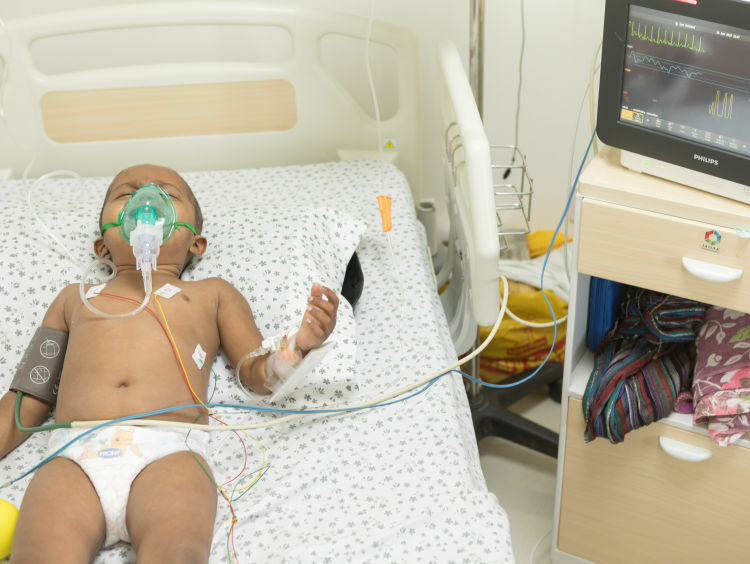 It is blood cancer.” Mahesh, Prerna’s Father, police constable, Hyderabad. It all began with Prerna’s mom, Manjula, noticing a sudden change in her behavior. When they decided to see a doctor, it was initially suspected that she was anemic and medication would help. Scans and tests revealed that the problem was much bigger, and in fact, would turn fatal, without immediate treatment. 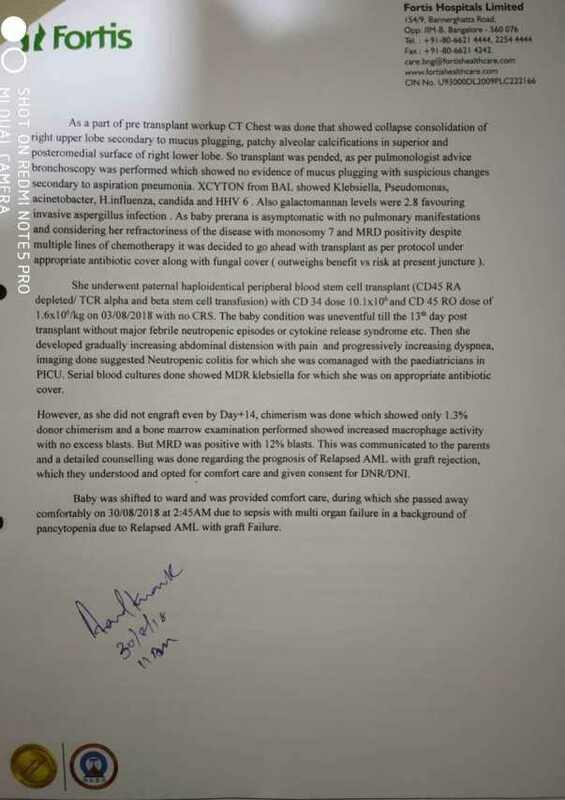 Prerna was diagnosed with Acute Myeloid Leukemia (AML)-a type of blood and bone marrow cancer. 4 months of chemotherapy and other treatments cured her and she was back to being the girl she was- active and always laughing. Mahesh and Manjula were elated. They could see their daughter run and play all over the house with her sister, Pranavi, who is 4 years-old-now. But it was short-lived. 6 months went by and cancer struck again. This time, posing a greater danger to the little girl’s life. 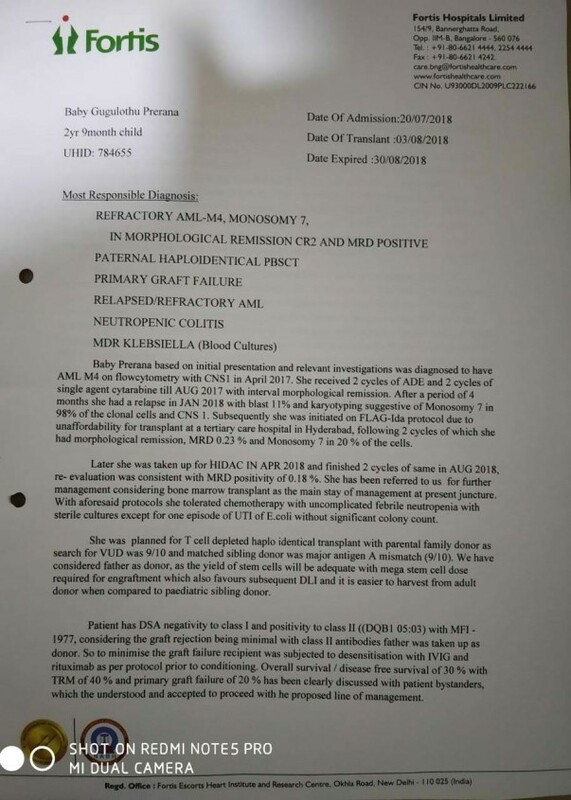 The spleen enlargement was visibly greater and her ability to eat food had reduced considerably. She could barely stand for few minutes without crying in pain. “Like any other child of her age, she hates injections and tubes. It breaks our heart to see her survive and live on the verge of death. For the past one year Manjula has been suffering from Leprosy. She can’t feel the scorching heat even when she walks barefoot. Torn between caring for her daughter and helping herself live, she breaks down inconsolably. Amidst all this Pranavi has hardly received the time and care a daughter deserves from parents, but she prays for her sister,” says Mahesh as he slips into silence, as he gasps for breath. While things have only taken a downward spiral so far, now, there is hope. 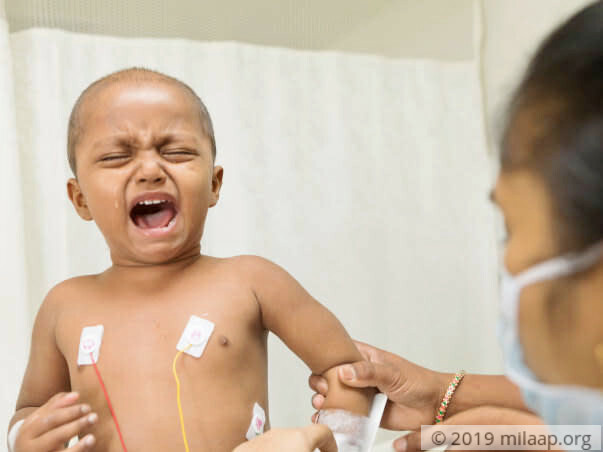 Prerna can be cured with a Bone Marrow Transplant (BMT). Pranavi is a 100% match and will be the donor. This is possible, only if he afford to pay 30 Lakhs for the procedure. He has been working as a police constable in Hyderabad and spent more than 10 Lakhs in the past year. In a week, he spends more on medicines and tests that he can earn in a month. This has pushed him into a deep well of debt. Medicines and chemotherapy have kept Prerna alive. 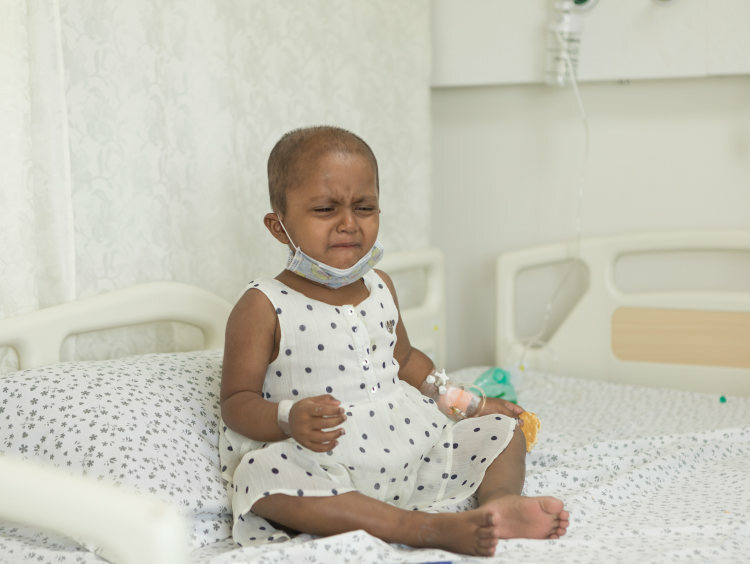 In the face of despair and multiple challenges, Mahesh continues to fight and leave no stone unturned in seeing his daughter cancer-free. The BMT will cost 30 lakhs, but he has exhausted all his resources. He has nothing but the fear of losing his daughter and a mountain of debt to cling on to. He needs your help to save his 2-year-old daughter beat cancer and go back home to her devastated mother and bring a smile to her face. Thank you for the love and support you have shown. The family is grateful for your generous contributions made towards Prerna's campaign. A portion of the funds have been utilised to settle down the hospital expenses incurred on her treatment. The remaining funds post discussion with the family and the hospital will be used for 2 other campaigns which require urgent support so that the patients can undergo the required treatment at the earliest. 1. https://milaap.org/fundraisers/help-mahesh-foroperation - Mahesh, a youngster has blood cancer. His family is too poor to pay for his treatment. 2. https://milaap.org/fundraisers/support-mrkumar - Help, 48 years old, Mr.Kumar KC who is suffering from blood cancer and needs chemotherapy and a bone marrow transplant. 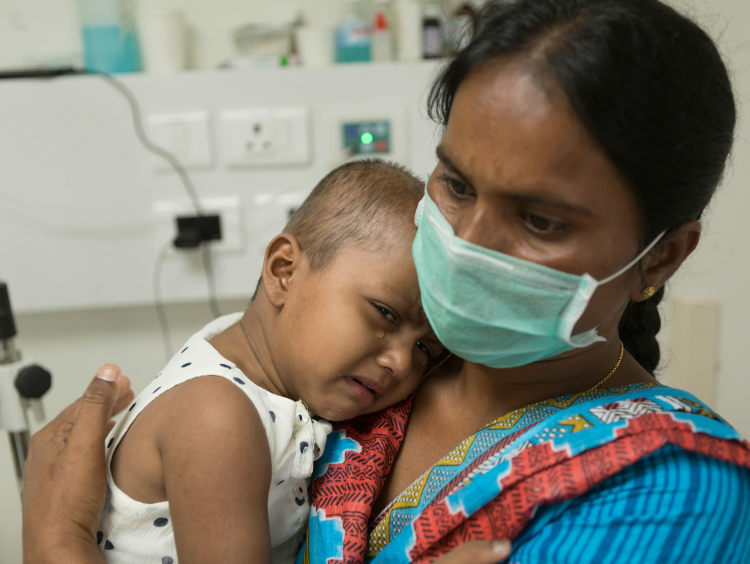 Prerana successfully underwent the transplant, however, post 13 days of her surgery, she developed high fever and her health deteriorated. She was given anti-biotic treatment, however her dyspepsia increased. Doctors tried their best but could not save her. The family is grateful for the support you have shown towards Prerana. We are in touch with the family and the hospital to understand the utilisation of funds. Please allow some time as this is a difficult time for the family. We will keep you posted. 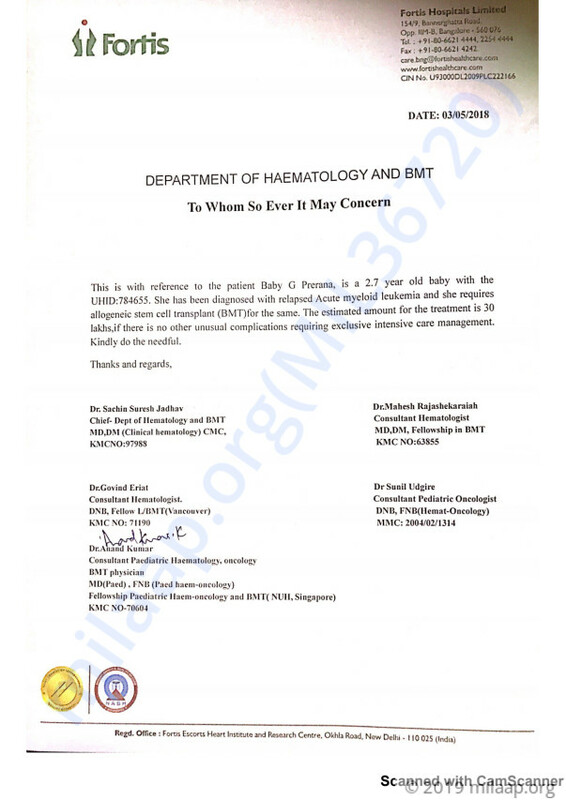 This is to inform you that Prerana will be starting her bone marrow transplant today onwards. We will keep you posted on her response to the treatment.